Ever since the USDA recently approved the first genetically modified potato for planting in the US, individuals across the country became concerned that their supermarket potatoes would be tainted with a new GMO creation. While the GM potato may soon be found in many supermarkets and restaurants, fast food giant McDonald’s has surprisingly announced that it would not be sourcing these GMO potatoes. This is even more powerful when we consider the fact that the creator of the new mutant potato is also McDonald’s current main supplier for their potato supply. The new GMO potato, which has been named ‘Innate’ by its creator, Simplot, will be engineered to brown slower than non-GM potatoes and bruise less easily. It will also contain less of a probable carcinogenic compound known as acrylamide, which appears when potatoes are fried at high temperatures. Simplot reassures the public that the method in which these potatoes are created aren’t nearly as ‘alarming’ or ‘aggressive’ as techniques used by other companies, such as Monsanto. But we aren’t convinced that tampering with mother nature in such a way is a good idea. When, or if, Innate hits the market, it is expected to take off for several reasons. The non-browning and non-bruising aspects of the GM potato will undoubtedly appeal to farmers, who will be able to sell more appealing potatoes that would otherwise be wasted. Supermarkets will also be happy with the product for these reasons. The other huge buyers are the consumer, and big buyers such as McDonald’s. Well, if McDonald’s were actually in the market for GE potatoes. With McDonald’s reportedly buying 3.4 billion pounds of potatoes annually in the United States, it would have meant a huge profit for biotech and sellers of GMO potatoes. But it turns out that the fast food giant won’t be a leading distributor of this questionable new creation, as we would have expected. A company spokesperson said:“McDonald’s USA does not source GMO potatoes, nor do we have current plans to change our sourcing practice.” We will just have to see if this actually holds true in the future, or if McDonald’s is simply avoiding negative publicity. When you think about it, it almost makes sense. 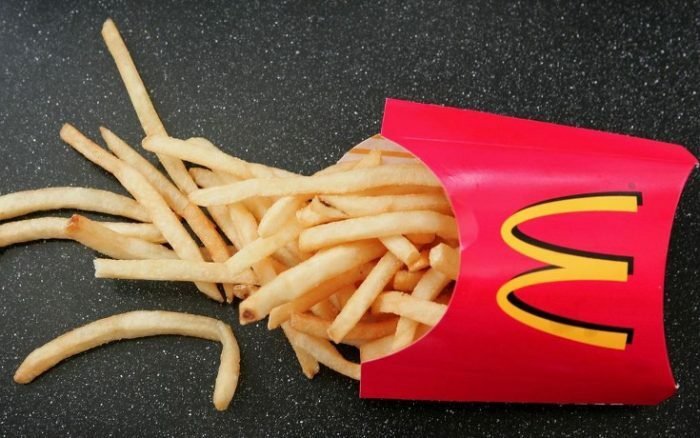 If McDonald’s were to pick up the GM potato, the main selling point would be: “our new fries might be less carcinogenic than the ones we’ve been selling you for 50 years.” I don’t think that would be so smooth. So if they can’t market this new shift, why take on ridicule from the public? I’d like to see McDonald’s try to explain that in their new ‘transparency ad campaigns’ it has been running. While the GMO potato wouldn’t be as helpful for McDonald’s as it would others since french fries are the primary potato-food sold, it’s still surprising though, to see McDonald’s refuse Innate. After all, the company serves up low-quality food riddled with toxic ingredients to millions of people. Simplot may be able to sell its questionable creation for now, but the food movement will undoubtedly complicate things Big Biotech. Awareness is growing every day, and it will continue to do so. The major food comps add all kinds of chemicals to the food we consume, have been for years and years. Many of the additives, like hormones, pesticides and antibiotics, have been linked to an onslaught of cancers and nervous system disorders. Be wary of everything you consume not just the new gmo foods! Not to mention that most of the additives put into our meats and produce to make them “safer” or “fresher longer” have also been linked to sterilization in many humans. Can someone say population control? Potatoes get brown. That’s what they do. These sick scientists ought to just leave Mother Nature alone and quit trying to force their creepy little experiments on the rest of us. What sort of expertise do you have in biotech? If it’s not just a publicity move, and they don’t eventually give in and just buy them anyway. Nope. Not gonna fall for it until I see them advertising it (which I place a little bit of truth in, since false advertising these days seems to land everyone in court with a class-action lawsuit). Just one more reason for me why giving up all fast food is the best thing, ever.